At Groupon’s last funding round, about 7 months ago, their valuation was about $1.35 billion, about 17 months after their real commercial launch. If the price talk on the Google deal is to be believed, that’s a pretty impressive what, almost 500% annualized growth rate? Not too shabby, eh? 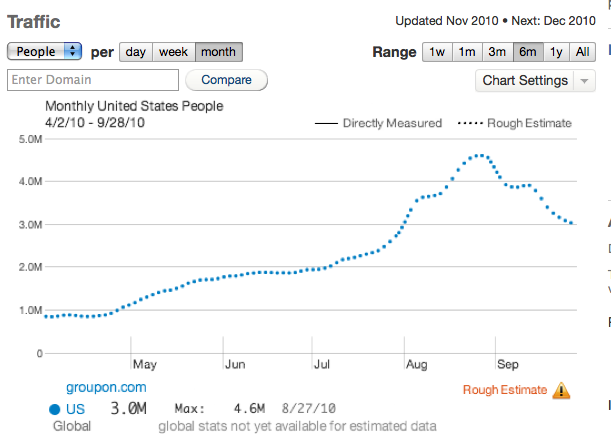 The point is (and this may not be an entirely accurate measure) that the odds of Groupon continuing that tremendous growth – as a stand alone company or rolled-up into a larger, more established firm with synergistic opportunities – are slim, especially considering measurement firm Quantcast shows that the firm’s popularity peaked around the end of summer and has since dropped-off substantially. Many other people in my twitter stream have also voiced concerns that Google is overpaying for Groupon and that this may be a sign of a major tech/web 2.0 bubble. I’m not going to go so far as to make such prognostications, however I will say that there is certainly some stupid and self-defeating competition going on between Google/Facebook/everyone else for not only talented employees but for hot new(-ish) startups that compliment the established firms’ own growth strategies. Google is hot on local, this much is hardly news, but pursuing a company whose only barrier to entry (if it can even be considered one) is its early-mover advantage/”critical mass,” is likely not going to be recorded in the annals of history as a very smart move. Google could easily spend $100 million (ballpark, even if its 5x+ that the point remains) developing its own Groupon-killer and another few hundred million (if any) marketing it et voila! 1 year, Google wins, Groupon loses or at least suffers a serious loss due to Google’s existing penetration in everything from search to local. Hell, Yahoo, Yelp, and everyone else could do the same thing and leverage their existing popularity and likely, they already are (or have plans to). $6 billion? Ceteris paribus, methinks that’s a bit rich considering we haven’t heard (unless I’ve missed it) about anyone else paying nearly that amount/multiple. $3 billion? Maybe, but still seems a tad rich depending on deal structure/consideration/etc. I’m going to mostly ignore the bulk of the political/military/etc data dump from Wikileaks this week and instead focus on what Julian Assange claims is their next leak, oodles of information about one of the big U.S. banks that will paint the firm in a less-than-ideal color. Regardless of which form (if any) of efficient-markets you believe, now that Wikilinks is starting to attack (which I believe is the proper word) the private sector, we are almost certain to see tremendous ripples throughout the capital markets the likes of which we haven’t seen since the Financial Crisis first hit. So is Assange saying that he and his organization (or whatever) will be the sole arbiters of what constitutes a “good company?” Also, while generally it may be true that well-treated (however we or WL wants to define that aside) employees, valued employees, one’s that are not expected to do morally/ethically/professionally questionable things are less likely to turn on their employer, in any organization there will inevitably be at least one or two (or more) disgruntled employees with an axe to grind. At one of my former employers (a large U.S. bank), I knew enough about how screwed up certain things were that I’m fairly certain many people would be quite interested to hear about them. I liked getting a paycheck, and want(ed) to continue to get them in the future in the industry, so, like many others, I have largely avoided communicating any of this information to the outside world. Additionally, I understood that while I felt compelled to serve shareholders, I was subject to a similar allegience to my friends and co-workers within the company whose well-being would no-doubt be adversely affected were I to release internal information to the outside. I am no hero, no pillar of moral strength, no causehead or idealogue; I’m just pointing out that unfortunately, for every employee unwilling to leak potentially damaging internal documents/information, there’s likely at least one that is or who doesn’t understand the full consequences of so doing. Thus, just as I fear the SEC’s proposed “whistleblower penalty” may introduce adverse or perverse incentives into organizations, I’m confident that we are not far from the day where we see an employee (or several) come to severely regret his/her decision to provide information to Wikileaks. This reminds me of Citigroup’s Chuck Prince when in 2007 he commented something to the effect of “…as long as the music keeps playing we have to keep dancing,” meaning that were Citi to stop the risky lending/trading practices that largely caused the Financial Crisis, shareholders would have his head on a stake, that is, the stock price would crash as Citi’s financial performance lagged behind that of its competitors. The point is that it seems Assange is living in a dream world, one vastly different from the one in which most of us live, where decisions are black & white, where incentives clearly push us to make “the right” decisions time and time again, or if not, he, our savior, is here to make sure our incentives are properly aligned. Upon what research does Assange base such a claim? Even the most idealistic, ivory-tower-inhabiting economics professors most-often shy away from making such broad, general statements. Surely, more transparency is generally preferable over opacity (we’d rather have exchange traded derivatives than a gordian knot of private otc contracts, for example), but as with most things, there are exceptions and boundaries – both practical and legal – to absolute transparency. We call these things trade secrets, intellectual property, and the ability to conduct business without fear of fantastic unexpected and grossly unpredictable events (the release of IP or internal procedures/strategy, for example). Wikileaks and Assange represent a new, unilaterally-acting force the likes of which businesses and governments must now contend. The problem with them is that Assange, via WL, is now playing God, or at least trying to; in his mind, he and his organization have the right, nay, the duty, to act as judge, jury, and executioner. They have the duty to expose the day-to-day activities of low and mid-level employees who were simply going about doing their daily duties. We’re not talking about Nazi SS Officers who, when on trial for war crimes, claimed to simply have been following orders; we’re talking more often than not about normal people trying to hang-onto/climb the corporate or government ladder, not people immediately responsible for mass murder. No doubt we may very well see evidence that some very high-ranking individuals have said/done some things they’ll come to regret, but as far as I can tell, and as far as I can predict, the bulk of the information will not implicate such influential folk. As I tweeted earlier, I’m certain that Assange (and WL) are nowhere even remotely close to being unbiased; quite the contrary, I’m confident they have a mission, a set of goals, an endgame towards which they’re working. What this endgame is, however, is up for debate. My best guess though is that this will end poorly, not only for Assange, but for many otherwise (mostly-)innocent people. Assange may think he now has the opportunity to re-order the World and the dynamics that govern it, and while there may be some inkling of truth in that, I doubt he realizes (or is capable of so doing) that the effects of Wikileaks will spread further, faster, and deeper than even he could have ever predicted. I’m of a semi-firm belief that while clearly sub-optimal, our current form of democracy (and capitalism) is better than any other options out there, as I believe Churchill said “Democracy is the worst form of government, besides all the others.” Assange likely does not agree, not in the slightest. As much as I hate to perpetuate stereotypes, given his background in the liberal hacker underground of the 80’s and 90’s, I somewhat expect he’s of the mentality that the world can quite easily function in a “free information” mode, which in order to usher-in, Assange will, intentionally or not, bring the world as we know it into anarchy and chaos. I hope I’m way off base here, that Assange realizes the power he holds and ceases to abuse/misuse it, and that others with similar aspirations/ideals do the same. As I am with my investments, I’m hoping for the best, and preparing for the worst, that is, I’m guardedly optimistic this phenomenon will be more about hype than action. Why Didn’t Economists Predict The Collapse? I’m not going to go through this whole debate because it’s largely been beaten to death (although I still haven’t seen a really great explanation or set thereof), but this one paper (with a fantastically small sample size of 19) seems to indicate that one simple tweak to regulations academic/professional Economists are subject to may help us avoid this problem again. Economists, especially those that like to tell Congress, the SEC, etc how Wall Street should be regulated may be due for a taste of their own medicine. How about we make all economists, from Krugman to the whole Squam Lake Group, to the National Association of Realtor’s economist adhere to something similar (if not more strict) than SEC Reg FD (Fair Disclosure)? What? One of the members of Stanford faculty and an economist on the Squam Lake group is on Moody’s Ratings Board? He should have to explicitly make that aware every time he speaks, writes, and appears in the media. The National Association of Realtors’ economist cites statistics/predictions 20% rosier than anything “independent” economists do? Fine, but everytime the media quotes the NAR’s #’s, they should have to explicitly state the painfully obvious conflict of interest. Now, I’m not nearly so naive as to expect this will happen within my lifetime or ever, but regardless, the fact is that these economists appear to the public, our lawmakers, regulators, and the media as (among the most) unbiased commentators, yet unless I’m mistaken, they have no formal, legal requirement to disclose conflicts of interest? On what planet does that make sense? Largely, these men and women went to the same schools, had the same professors/mentors, were taught and adhere to similar, if not the same ideologies, etc. The public has a right to know about any and all conflicts of interest these economists may have, end of story. If you’re a econ professor at the University of Chicago, you shouldn’t be allowed to identify yourself as such if you also happen to be a consultant to several investment banks. That’s all I really have to say on the matter right now. 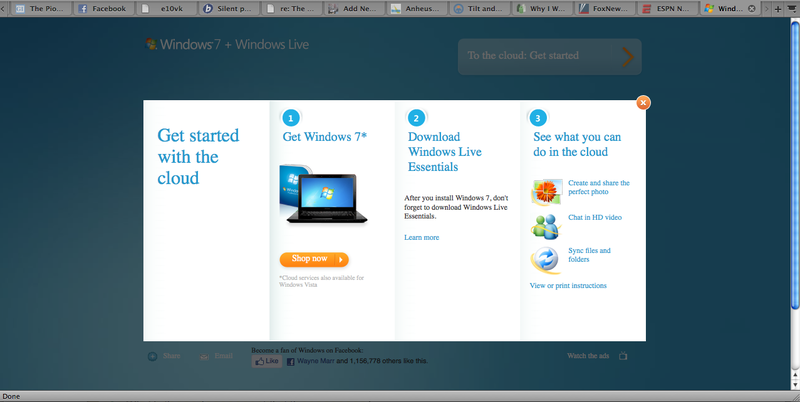 A visit to Microsoft’s website to learn more about what aforementioned “cloud” actually is tells one that in order to find out, one must first buy/download/install Windows 7. Now this “trust us, buy now, don’t ask questions, you’ll figure out why and thank us later” sales strategy is not new, however it is seldom used to this degree (successfully, that is) in the software/tech space. As a matter of fact, I can’t think of any other campaign of this scale made use of such a advertising/sales strategy, besides Apple, but their websites are always much better/more informative in my opinion. (This is not to say there aren’t examples, just that I can’t recall any others As always, if you can, be sure to let me know by email or in the comments). 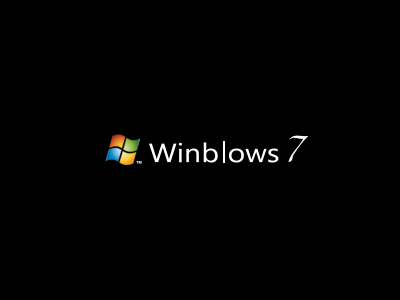 In fairness to Microsoft, I played around on the website a little more and there are some more quick videos (~30 seconds +/-) showing what you can do with Windows 7, e.g. viewing a photo gallery on your computer and with a few clicks upload them directly to Facebook. This may seem like magic to those with only the most basic level of computer literacy, but its hardly revolutionary, to put it nicely. If this is, in fact, the case (or something like it), I’m not so sure I agree. If my Mom can figure out Facebook, it’s not exactly a leap of genius to understand the idea that when you, for instance, upload a picture to Facebook, it can be accessed from anywhere with an internet connection, as opposed to when you just had it on your home computer (drive), and could only access it from there. 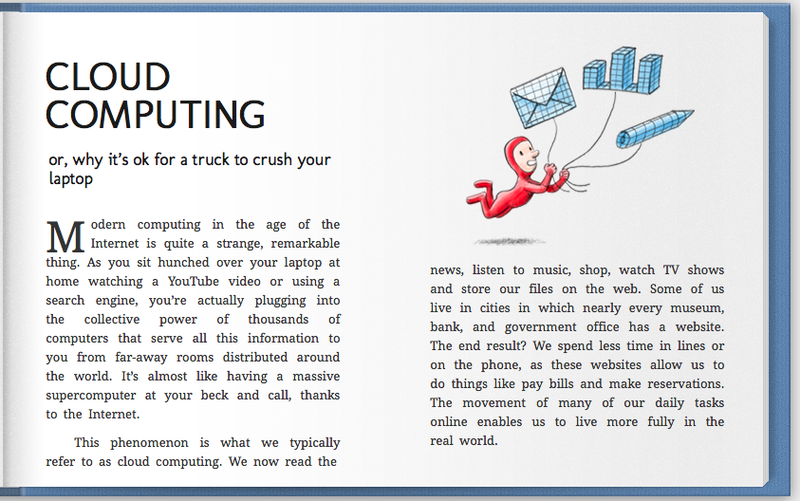 Indeed, a 5 second google search (my time, not google’s, of course) brought me to this, from a book apparently called “20 Things I Learned About Browsers & the Web,” which succinctly (in an extremely simple manner) explains cloud computing in about a paragraph of “Curious George” size/style typeface. I don’t necessarily disagree with the cynical approach of pushing Windows “cloud” capabilities without explaining what they are, but I think a little education/knowledge could go a long way for Mr. Softy. Especially true now, in the social media age, consumers do not want to be made to feel stupid or uninformed. Introducing new terms to them without giving them a little information (like in the image above) may be a major faux pas; had they instead devoted some time/effort to educating the consumer, bringing them into the fold, making them feel like they’re part of the cloud computing phenomenon, I think the campaign would be FAR more effective. All of 1 of my ~650 Facebook friends “likes” Windows 7, as do about 1.1 million others. Impressive but I think extrapolating true adoption or even fan-dom from Facebook “likes” even as a proxy is a dangerous if not downright silly practice. Microsoft has a long and storied history of pushing “technology” onto consumers, which you can read about on Wikipedia, Techcrunch, or several books I’m sure have been published on the topic, but most of this was done before Facebook, before Youtube, before Blogs (well, mainstream ones at least), and before Twitter. I’ve studied social media failures, or, as it were, business strategy failures magnified by social media (mis-steps), and this, while not nearly as egregious as others I’ve seen, may very well be on one of my future list of FAIL. 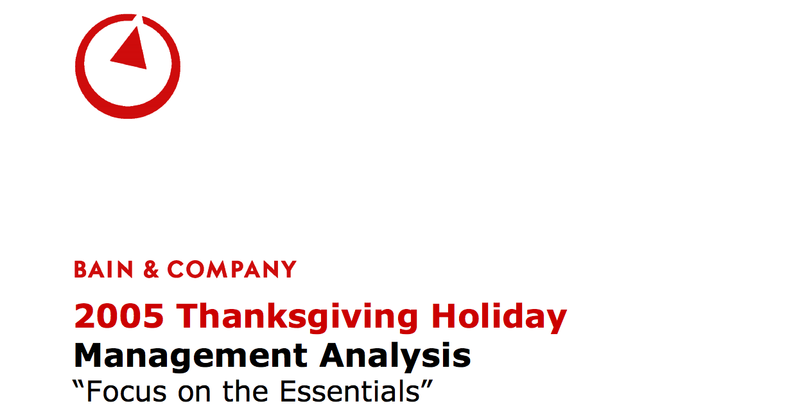 This story is still being written, so, I may be proven wrong in my skepticism, but alas, only time will tell..
Thanksgiving Prep Analysis, Courtesy of Bain & Co.
From the formerly-fantastic Leveraged Sellout, this is THE conclusive analysis of the Thanksgiving Holiday. Even those of you seeking last minute help should benefit from this. Enjoy! Over the past decade (and most seriously the past 3-4 years) I’ve played around with several “community”and/or “social” stock and finance sites, including the seldom-useful, antiquated (in my opinion, at least compared to the competition) Yahoo! Finance message boards, The Motley Fool, Marketocracy (remember that? ), Minyanville, Seeking Alpha, and more recently/frequently, Stocktwits and Twitter (We also have been syndicating our content on Business Insider of late). I’ve dabbled with Covestor and considered Stockpikr, but never gave either anything even approaching the ol’ college try. Each of these things had or have several pluses and minuses and down the road, I’m sure I’ll dabble with some as-yet-conceived “social” finance websites/tools. Minyanville was one of the first social finance sites I got into and Todd, Kevin and the crew there certainly do a helluva job (and because they’re awesome, sponsored the inaugural Street Meet we had earlier in the year! ), but admittedly, as most of my intraday commentary is twitter-based, I haven’t been reading/commenting nearly as much as I should be. Kevin and I have talked on/off about me posting there as well, but both of us have plenty on our plates so those conversations have been in some state of flux for a few months. Now that I’m writing this I really need to take care of this. Note to self: Schedule drinks with Kevin! While I don’t particularly support their sometimes misleading headings and artificial pageview/clicks from slides hows and whatnot, Henry, Joe, etc (and formerly my man Carney) have turned Business Insider into a pretty impressive operation. Their content management system is pretty good, although my submissions there require at least 1 person to approve them (a person who isn’t always as knowledgeable as I nor incentivized to publish my posts in a timely fashion), although compared to the unfortunately more traditional editorial standards/”oversight” at The Atlantic, its a veritable walk in the park to publish on TBI. Also, The Atlantic doesn’t syndicate content, not surprising considering the storied history of the magazine (extending to their web presence), so when I do decide to post there, its exclusive (an honor, no doubt), but limits breadth and visibility. Where am I going with this? First and foremost, I think today quite an appropriate time to thank the editors/proprietors/managers/owners/employees of all these outlets for sharing my vision and giving me the honor of being able to post on their sites. Similarly, I’d be remiss if I didn’t thank our readers, without which this would largely all be in vain. Last, but certainly not least, I want to thank my fellow blogger/commentator types, from whom I’ve learned so much over the past few years, from whom I depend to to educate me on things outside my realm of expertise/experience. Secondly, and perhaps selfishly, I want to ask all of you, whose opinions I’ve grown to value so much, your thoughts. While I love doing this, and take a certain amount of pride in so doing for the low, low salary of zero, at some point down the road I’d like to reach the level of exposure/popularity where I can at least cauterize the hemorrhage in my bank account, so-to-speak. 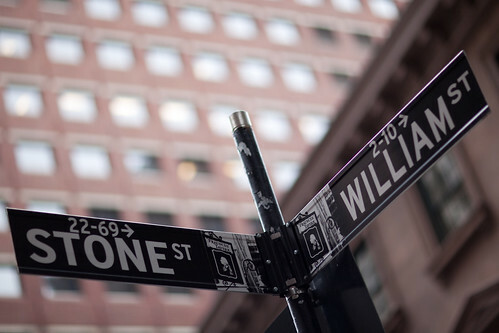 Some have wondered when (in whatever form) Stone Street Advisors will start managing money. To be honest, the thought had crossed my mind, but I never really sat down to think about whether such a move would be possible (and more importantly, profitable). Others have suggested keeping some content free, but shifting the best, most actionable to a paid newsletter or something along those lines. I’m not quite sure how much money such newsletters make or it’d be worth the time/effort, but I’m not diametrically opposed to that approach in concept yet. Others have suggested a variety of other moves, some reasonable, some bordering on cockamamie, but most somewhere between the two. So, pardon the rambling, stream-of-consciousness, but these are the things I’ve been pondering for quite some time, and since I value your thoughts, I thought best to share with you all. If you’ll indulge me, you’ll share yours. If not, thank you for reading, and have a Happy and Healthy Thanksgiving! (and to our International readers, I’ll email you some turkey, heh). I tweeted this earlier but for those who missed it, let me throw out a few reasons why I don’t buy the “hype” behind the GM IPO/”successful” restructuring/turn-around, in no particular order. Still a bit opaque. Sure, they’ve disclosed alot of the things I had questions about (pensions, etc) but its not only a lot to process, with so many moving parts – many of which could turn into problems down the road – that I’d be hesitant to buy into the story (stock) for anything other than any IPO pop + subsequent pop from index purchasing. For more, see this great post I somehow totally spaced on (thanks @rmsnickers!) from Francine McKenna. Preview: Unaudited financials are just a wee bit of a red flag. GM’s early leadership position in China is under alot of pressure. Buick is a big draw there, but rest assured, Volkswagen and GM’s other competitors won’t let them enjoy that position for long. A successful IPO does not a successful reorg/turnaround make. GM’s employee count is down about 75,000 from pre-bankruptcy and they’ve closed about a dozen plants, but as I said above, its a huge, sprawling company in an intensely competitive industry. Throw in a history of bureaucratic bloat, questionable (at best) product design and basically every aspect of the company from the past 30-ish years and I’m nowhere close to buying into the lean & mean story the company, its underwriters, and the media would have you believe. The Chevy Volt is doomed for failure. I’d just as soon chalk up all the recent attention from the Automotive Media up to IPO-related pre-excitement rather than any realistic expectation that it’ll be a commercial success. Without heavy Government subsidies (here we go again with that Government thing again), no one would even consider buying it, save for the most economically ignorant tree-hugging types. Only time will tell. Not nearly enough time has passed to see this story play out. I seriously advice ignoring anyone who claims otherwise. Remember, this is just a very short take, each of these bullet points can easily be its own post (if not several).